Many of us go through what I think of as the “thrashing stage” when we first start experiencing the pain of Burning Mouth Syndrome (BMS). It is a time of anger, sorrow, guilt, and confusion as we try to determine what is going on, why it happened, and what we can do about it. You may have thought, “If only I hadn’t done this, or if only that hadn’t happened…I would not be in pain.” It isn’t logical, but often, neither are we at this stage of our journey. We go to doctors who do not know what is wrong, but who do their best to diagnose and ease our pain in the meantime. Some doctors can do more harm than good as they assume it is part of a menopausal array of symptoms or thinks we are merely depressed. Consequently, if you are like me, in the first two years of this episode of BMS I tried multiple medicines. Some in tandem, some alone, some ramped up slowly and some did not. The point is, it is possible that something that could have helped may have gotten lost in the thrashing stage. 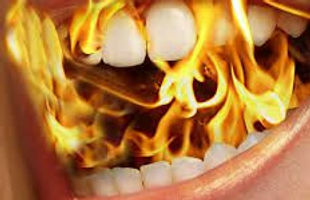 The Burning Mouth Support Website recently posted a very small study from Spain that was done in 2015 and stated it had found a new therapeutic option. You can read the report here. In it, the researchers used a dopamine agonist that had been developed for restless leg syndrome for treating a small group of BMS sufferers. It outlines a very slow ramp up from a small dose of Pramipexole, increasing over time to a level that gave pain relief. I looked up the drug and found that the brand name was Mirapex. I keep fairly detailed records of my treatment history, since it is extensive, and my memory had not failed me. I had tried Mirapex back in 2009, but that was in the first two years and to be frank, it may have gotten lost in the shuffle of specialists, tests, and even oral surgery. It will be worth talking with my neurologist to see if this is something I should try again under much less hectic circumstances. It is a very slow building dosage treatment that starts out very small and then goes up to the level that each individual finds helpful so it will require coordination from my doctor if we decide to try it again. What is the lesson here? Records matter. If I hadn’t kept good records of the meds I tried and the results I got, I would have no idea if I had ever used this medicine before. I would not remember eight years ago why I went on it, off it, or what the circumstances were at the time. If we try this medicine again, and it actually helps, it will be because of two things. The BMS Support Website and the records that I kept. If you are beginning this journey, start recording your history with dates, doctors, dosages, and outcomes. If you have been suffering awhile, go back and see how much you can reconstruct. This is a marathon, my friends, not a sprint, and for some of us, it is more like an Iron Man. My prayer is that your remission will happen swiftly, but you can’t count on that, so do your homework and help your doctors help you. After burning for over 6 1/2 years, I have been healed! Woot!! I have been burn-free for 5 days now. Zero burn. I read the report regarding the 65 year old woman who was cured by taking an antiviral medicine for the herpes simplex type 1 virus. It worked for me too! Spread the word! Cindy, I am glad the antiviral worked for you, and that your secondary BMS was cured when your primary herpes simplex type 1 virus was cured. I had hoped that this would be the case for me, as well, when I heard of this outlier case, but I tested negative for the virus and so that was not the cause of my primary BMS. People should get that checked and ruled out, but it has been a rare resolution so far.